1. Melt butter in a skillet over medium heat and cook peppers, onions, jalapeño and corn until lightly caramelized. 4. Layer on pepper and corn mixture. Spreading as evenly. 5. Sprinkle an even layer of cumin next. 6. 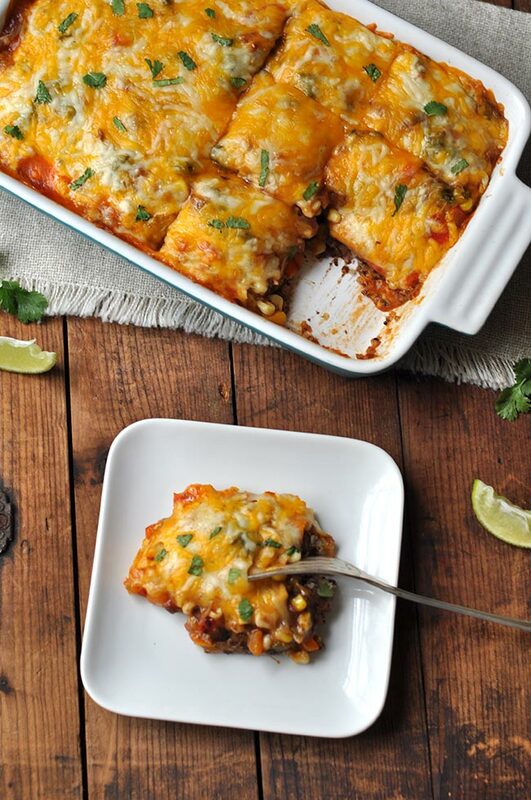 Pour enchilada sauce over entire casserole. 7. Top with a final layer of cheese. 8. Bake at 350˚ for 25-30 minutes on a low rack. Serve topped with fresh cilantro. 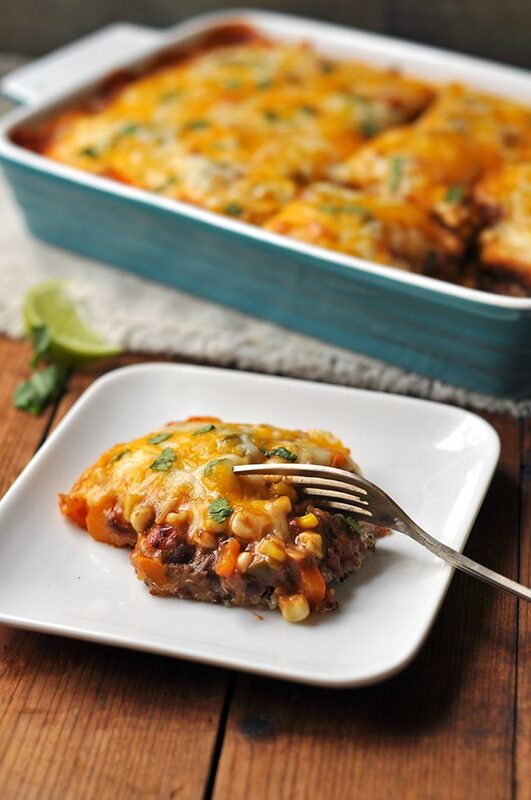 You’re not going to believe how delicious a healthy, vegetarian Mexican quinoa casserole can be until you’ve tried it. Yes, healthy casseroles do exist. How do you make a vegetable casserole? The funny thing is I actually intended to include chicken in this recipe but when I got home, I found our rotisserie chicken had been turned into a soup by the Mr. Fine! I’m not complaining. I love that I’m not the only one who cooks around here, ya know what I’m sayin? So I had to get a little creative a take this casserole in a vegetarian direction. What I decided to do was come up with a vegetarian replacement for the texture and flavor of the meat. I decided to use a combination of refried beans, quinoa to make a faux “meat.” Once the vegetables, cheese and enchilada sauce blend with this combo, you don’t even realize you’re missing the meat. Could you make this casserole with meat? If you’re not a vegetarian and you want to mix things up by making this using meat, you can do that. 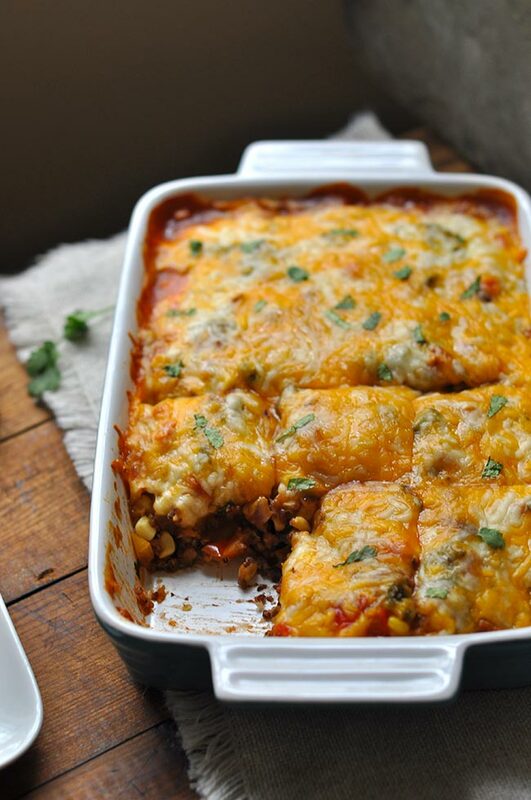 Shredded chicken or ground beef would work well in place of or in addition to the refried beans and quinoa. Just include a layer of chicken, beef or pork and everything else stays the same. Is this vegetarian casserole freezer safe? Yep! You can make ahead and freeze the whole casserole or you could precook the quinoa and keep that ready t go in the freezer so all you have to do is microwave it to defrost, then prep the casserole. You can also freeze diced peppers or buy peppers already deiced. This cuts out a bit of prep time and makes things easy to prepare on a weeknight. Looking for other vegetarian recipe ideas? Browse all my vegetarian recipes. 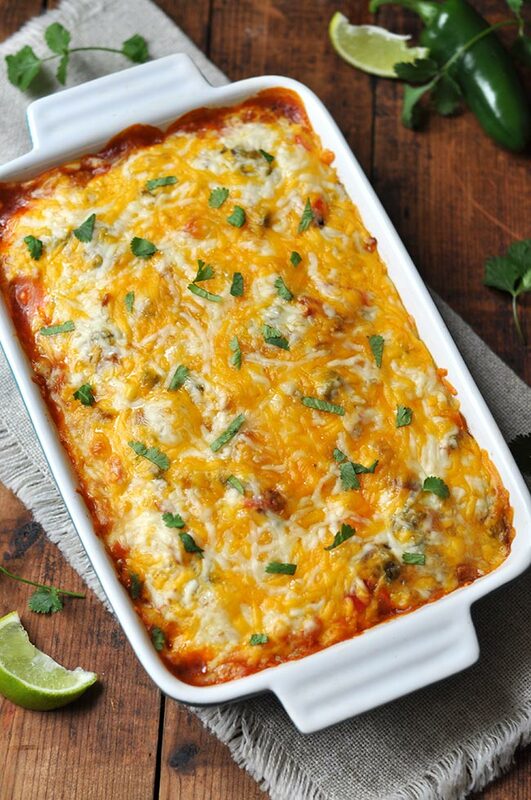 This healthy vegetarian Mexican casserole was featured on Inspire Me Monday! I have a question about the quinoa. Do I cook one cup dry and then add it? I know it expands a little. This looks so great I hope to make it next week! Hi Sara, thanks for asking. It would be one cup of dry quinoa. Cooked it does expand a little. I am pretty loose about measuring things in general lol so if you added a cup of cooked quinoa it wouldn’t make a big difference. Don’t stress too much about it but I do typically measure it dry since it’s harder to estimate how much dry quinoa will become 1 cup cooked. This was so delicious! I subbed quinoa for barley just because I had some cooked already and it was wonderful. A real hit at Taco Tuesday with my girl and guy friends alike ? ?